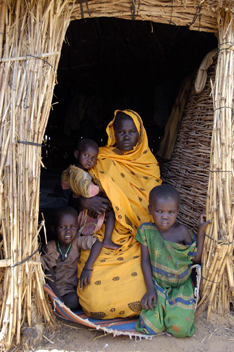 The United Methodist Committee on Relief has distributed woven mats to displaced families in the Darfur region of Sudan. Anne Ryckman’s $1.7 million bequest will enable the relief agency to assist people around the globe. A UMNS file photo by Paul Jeffrey. A successful United Methodist businesswoman from Michigan has left a $1.7 million bequest to the United Methodist Committee on Relief. "A remarkable, independent and generous woman," is how the Rev. Cathi Gowin described Anne Ryckman, a deceased parishioner at St. Paul's United Methodist Church in Grand Rapids. Ryckman, a lifetime and active member of St. Paul's, was known for quiet acts of generosity throughout her life. The faithful United Methodist left a generous portion of her estate to UMCOR when she died on April 8, 2007. "We are so blessed and humbled that Ms. Ryckman remembered UMCOR in this way," said the Rev. Sam Dixon, the agency’s top executive. The gift is being used to establish a donor-directed permanent fund for the relief agency’s work. "The Ryckman Fund will provide for UMCOR's work for many, many years to come,” Dixon said. “Ms. Ryckman is certainly leaving a legacy that will benefit many thousands of people around the world." The first income generated from the bequest has been designated to a $200,000 challenge grant for a new campaign to provide every child in Sierra Leone under the age of five with an insecticide treated bed net. The nets will provide protection from malaria for those most vulnerable to the deadly disease. Bishop Janice Riggle Huie of Houston, UMCOR’s president, announced the challenge grant, along with a challenge to the denomination's Council of Bishops on May 6 during the council’s meeting in Bethesda, Md. The challenge is to United Methodist annual (regional) conferences and districts to match the funds. Many bishops responded to the challenge with personal donations totaling more than $1,000. St. Paul’s has been in close contact with UMCOR regarding the bequest and will continue to be involved in the use of the balance. "As a congregation, we are honored to be able to direct these dollars toward such an important cause and relief efforts in Sierra Leone," wrote Pat Clifford, the church’s mission chairperson, in a recent e-mail to Dixon. Several annual conferences are likely to match the $200,000 challenge by the June 30 deadline, making a significant step towards meeting the need for 1.2 million nets in Sierra Leone. "Our hope is to make a miracle of multiplication happen," Dixon said about the challenge grant. "We have an opportunity to directly save the lives of thousands in Sierra Leone, if we can act now." The net distribution will be part of a national measles vaccination campaign in partnership with the International Federation of the Red Cross, United Nations Foundation, and The United Methodist Church. UMCOR will play a key role in coordinating the net distribution and training malaria educators who will be at United Methodist distribution sites. Ryckman was a partner in a successful printing business in Grand Rapids. She co-owned the business from 1943 until the death of her partner in 1979, when she took over the company until she retired in 1985. She shared her success in business and investing through her generosity to others. She made numerous, always anonymous, gifts to help with the work and ministry of St Paul's and provide support to members of her church family in times of need. Ryckman contributed to the life of the church in many ways. "Every Thanksgiving she would play "Bless This House" on her violin," remembered Ellsworth Vail, who knew her for many years. He also recalled her homemade hot fudge, which was a fixture at church ice cream socials. 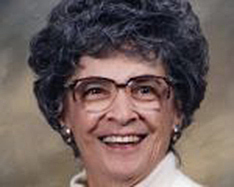 She was a member of United Methodist Women and active on several church committees throughout her lifetime. Vail recounted their service together on the building committee while the church was constructing a new building. "She was always pushing us to do things," he said. About 200 people come to worship at St. Paul's each Sunday. The two morning services seek to meet the spiritual needs of the changing community surrounding the church and the church's longtime members. "St Paul's has always had a strong heart for mission," Gowin explained. Approximately $2 million will be needed to purchase, train and distribute the nets in Sierra Leone. United Methodists have already contributed significantly to this effort through their gifts to Nothing But Nets. At least $500,000 more will need to be given by June 30 to purchase a sufficient quantity of nets in time for the November distribution. "We are challenging United Methodists everywhere to help us bring an end to malaria's misery in Sierra Leone," said Dixon. Every Nothing But Nets gift given through UMCOR Advance #982015 up until June 30 will be counted towards the Ryckman Challenge Grant and will go to support the Sierra Leone net distribution. Through June 30, donations made to Nothing But Nets, UMCOR Advance No. 982015, will go to the nets project for Sierra Leone. More information is available at http://new.gbgm-umc.org/umcor/give/manyways. *Scott is the executive secretary for communications for the United Methodist Committee on Relief.